Regiment/Catrawd: 19th Hussars attached to Royal Flying Corps. Ref No Grave or Memorial / Rhif cyfeirnod bedd: I.G.6. 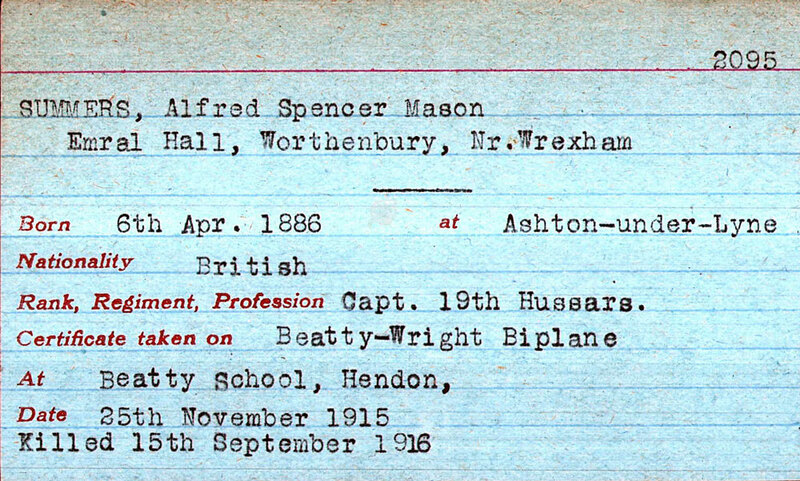 The Summers family was a well known and distinguished one in Flintshire and to explain who Alfred Spencer Mason Summers was, we need to go back two generations for a potted history. John Summers was born in Bolton in 1822. He left Bolton in 1842 to become a clogmaker in Duckenfield. He married Mary Woolley in 1848. He bought the irons for his clogs from a man in the next street. John Summers saw an opportunity and bought him out and started to make his own clog irons.He saw and bought a nail making machine at the Great Exhibition in 1851. His nail making business grew. He then decided to produce his own wrought iron and built a new factory at Stalybridge- ‘The Globe Iron Works’. John Summers died in 1876 leaving 7 sons and 2 daughters. The main burden of the business was initially carried out by the eldest and the third sons. James Woolley Summers and John Summers. By 1889, 6 of the brothers were partners although these family business partnerships eventually floundered. The business, however, expanded and eventually in 1896 they opened the Shotton Steelworks on land acquired on Sealand Marshes. James Woolley Summers the eldest son was born in Duckenfield Lancs in 1849. In 1883 he married Edith Mason, the daughter of Hugh Mason the MP for Ashton Under Line. They had one daughter Lilias and one son Alfred Spencer Mason Summers. James Woolley Summers was a member of Flintshire County Council and was Chairman from 1904 till 1910. He purchased Emral Hall, Worthenbury in 1904 and the family sold it in 1936. after which it was demolished. (Parts of it were used to build the Town Hall in Port Meirion) .In 1910 James Woolley Summers became the Liberal MP for Flint Borough until his death in 1913. 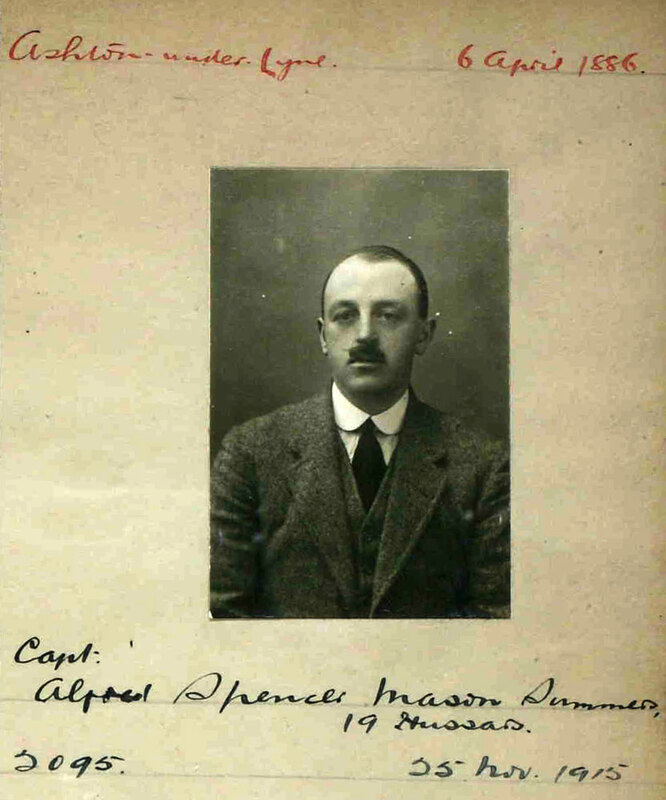 Alfred Spencer Mason Summers was born on the 6th April in 1886 in Ashton Under Lyne, Lancashire. The census of 1891 records him living with his family at Thomson Cross, Staleybridge. Head of the household was James W Summers who was 42 and an Ironmaster. His wife Edith was 33. Their listed children were daughter Lilias who was 7 and Alfred S.M. who was 4. There were three domestic servants and a Swiss Governess. The next census of 1901 records Alfred as a boarder at Eton College aged 14. The 1911 census lists Alfred as a soldier in the 1st Cavalry Brigade 19th Hussars at Wellington Lines Aldershot. He was 25. Three years later, in 1914, he married Judith Mimi Poole (1914, Qtr September, District London St George Hanover Square, Vol 1a, page 1083). The following year, Alfred who was a Captain in the 19th Hussars learnt to fly a Biplane. He took his certificate on the 25th November 1915 at Beatty School Hendon and was tested in a Beatty -Wright Biplane. His address at the time was Emral Hall, Worthenbury, Flintshire. He was then attached to The Royal Flying Corps. On the 15th September 1916, he was shot down over Ligny Beaulencourt, Somme and died of his wounds as a Prisoner of War. The Register of Soldier’s effects in which the army calculated monies owed to deceased soldiers, lists Alfred Spencer Mason Summers as Captain of the 19th Hussars attached to the Royal Flying Corps who had died on or since 15th September 1916. His legatees were listed as Mrs Judith Mimi Widow, Walter Summers and John Clarke Brown Esq who received £59 each. Alfred’s will was listed in the England and Wales National Probate Calendar. It says that Alfred Spencer Mason Summers of Emral Hall Worthenbury, Flintshire, Captain in Royal Regiment of Hussars, died 15th September 1916 in France. Probate London 26th June to Judith Mimi Summers and John Clarke Brown Esquires Effects £81, 624..16s..0d (And to think it all began with clogs and nails). Judith Mimi Summers remarried in 1918 one Bache McEvers Athole Hay.